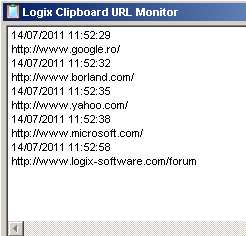 Logix Clipboard URL Monitor is a freeware URL sniffer for Windows systems. This application was designed to log all the URLs you have in your clipboard. It monitors Windows Clipboard allowing you to effortlessly record web page addresses you’d like to visit again. As soon as you copy an URL to your clipboard the program will detect it and save it in a file called MyURLs.log. This file can be found in program installation directory. Logix Clipboard URL Monitor recognizes WWW, E-MAIL or FTP links that were copied by user from any text with Ctrl+C. Logix Clipboard URL Monitor is distributed as freeware. That means it is free to copy, redistribute, install and use. If you want to report any bugs or request new features, please visit Logix Web page. Any feedback is welcome.